One of the audience members has a rather remarkable similarity to Ellen. 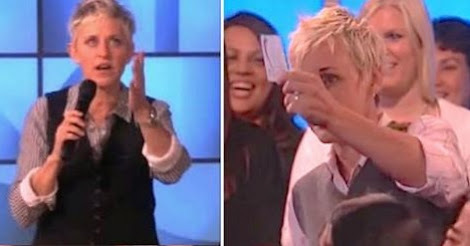 After the show, Ellen wanted to find out if it was her long-lost twin! When Ellen spotted Donna in the crowd, she said, “What am I doing in the audience? What? Why am I there? Am I in a parallel universe right now?” Since that taping, the clip of Donna’s chat with Ellen has been view more than 14 million times. Check it out below.